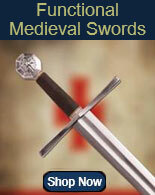 King Arthur Excalibur Swords for sale are 44 inches in all. 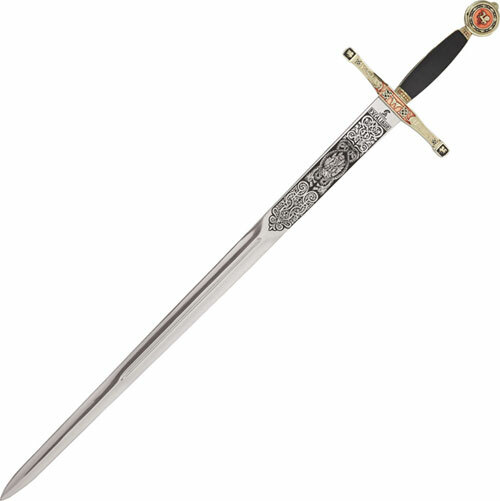 They celebrate the famous Excalibur, the legendary sword of King Arthur. They have a beautiful mirror polished 34 ¼ inch 420-stainless steel blade. 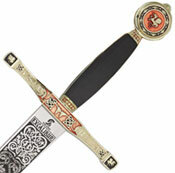 The unsharpened blade features a fuller groove and is etched with ornate medieval symbols. 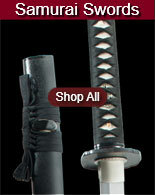 The name Excalibur is prominently etched upon the upper portion of the blade. They have a black real leather wrapped handle. The guard features gold colored metal and intricate medieval etchings. The gold toned wheel pommel features a red colored inlay with designs. These beautiful collectibles are manufactured in Spain. 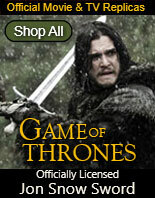 Buy the popular King Arthur Excalibur Swords for $179.99. Complete your display with laser etching services and wall mounts.